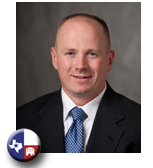 Kenneth Sheets is a fresman Republican State Representative representing the 107th House District of Texas. Kenneth’s father was honorably discharged from the National Guard in 1969. After a series of manufacturing related positions, he started a career with Vought Aircraft, working at the Grand Prairie facility on the C-5, B-1, and B-2 stealth bomber programs. The Sheets family settled in Mansfield, TX and together with his two sisters and two brothers, Kenneth grew up learning the value of hard work and the importance of defending our nation and our freedoms. Given his family’s history of military service – both of his grandfathers served in World War II and father in the National Guard – it seems Kenneth was destined to honor this calling as well. After his graduation from Mansfield High School, Kenneth enlisted in the United States Marine Corps, and in January of 1996 he began his training as a Marine. For more than fourteen years, he has served our country in both the Marine Corps and Marine Corps Reserves – achieving the rank of Captain, the first in his family to earn a commission. As part of the surge of troops ordered by President George W. Bush, Kenneth was deployed to Iraq and operated out of Fallujah with 2nd Reconnaissance Battalion, II Marine Expeditionary Force (FWD) from September 2007 until May 2008. His decorations for service include the Navy/Marine Corps Achievement Medal with 2 gold stars in lieu of second and third award; Selected Marine Corps Reserve Medal with 1 bronze star in lieu of second award; and the Iraq Campaign Medal. While serving in the Marine Corps Reserves, Kenneth returned to the Dallas area in order to earn an undergraduate degree. Working as a waiter and with funds from the GI Bill, he paid for his living expenses and courses at the University of Texas at Arlington (UTA). Upon graduation in May 2001, with an Honors Degree in Political Science, he was commissioned as a Second Lieutenant in the United State Marine Corps Reserve. It was during this time he met his future wife, Michele, while the two were working together at a local restaurant in order to help pay for their classes. Kenneth would go on to earn a Juris Doctor from Southern Methodist University, Dedman School of Law, graduating in 2004 and serving as Student Bar President. Kenneth and Michele were married on August 5, 2000 and are active parishioners of the St. Thomas Aquinas community. Their faith and activities within the church community are extremely important parts of their lives. "America can be a global leader in energy development and Texans can help show the rest of our country the way. We should allow for the expansion of new nuclear and natural gas power to help improve base load capacity for our state. This will help reduce rates for families, create new jobs, and cut emissions to help our environment."